"Yummy. My kids love them." Heat a large skillet over medium-high heat. Cook and stir beef, onion, and green chiles in the hot skillet until beef is browned and crumbly, 5 to 7 minutes; drain and discard grease. Add water, chili powder, salt, red pepper flakes, cumin, and garlic powder; bring to a boil. Reduce heat to medium-low and simmer. Stir refried beans into beef mixture and cook until heated through, about 5 minutes. Mix cream of mushroom soup and sour cream together in a bowl. Fill each tortilla with beef mixture and roll tortilla around filling. Arrange burritos in the prepared baking dish; top with sour cream mixture. Bake in the preheated oven for 20 minutes. 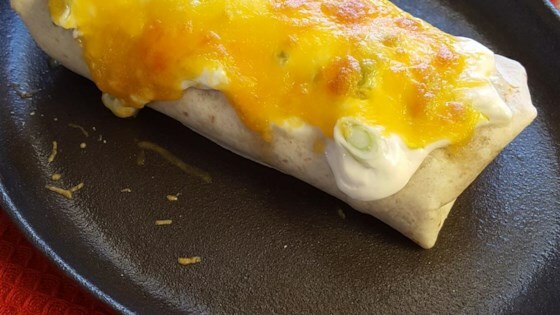 Cover burritos with Cheddar-Monterey Jack cheese blend. Bake until cheese is melted, about 10 minutes more. Seasoned beef-and-bean burritos smothered with enchilada sauce. My husband loved them. I wasn't as big of a fan as he was. I felt like they were a little bland. I may try more beef and less beans next time. I did appreciate how quick and easy it was though! Kept to the recipe. I made it for 6 adults 16 teenagers and they loved it?? THese were wonderful. Topped with home made salsa from this site. YUM! Very good, my husband liked it very much. I used mince fresh garlic instead of powdered. Will make again. Thank you.